Persfoto van een Mitsubishi Outlander, opgebouwd met gesloten opbouw. The latest version of the UK’s best-selling plug-in vehicle, the 2019 Mitsubishi Outlander PHEV, is now available as a commercial vehicle, offering businesses the benefits of an ultra-low emissions vehicle for deliveries in urban ULEV zones as well as the ability to cover long distances when required and minimise down time associated with seeking out charge points and recharging during the day. Being classed as an Ultra-Low Emission Vehicle means the Mitsubishi Outlander PHEV Commercial is also eligible for the UK government’s Plug-In Van Grant. This means business customers enjoy a saving of £7,900 resulting in an on-the-road price of just £25,113 (excluding VAT including the PiVG, VED and First Registration Fee). 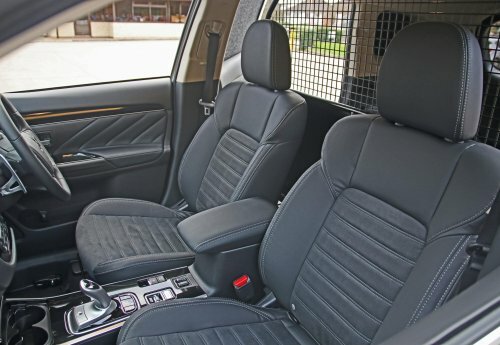 Based on the well-equipped Mitsubishi PHEV Juro 4WD SUV, the commercial version is fitted with a full, floor-to-ceiling bulkhead located behind the front seats, which is solid at the base with the top half comprising a protective metal mesh. The flat load area measures 1,650mm in length, 1,000mm in width (measured between the wheel arches), 800mm high at the tailgate and has a maximum payload of 510kg. The Mitsubishi Outlander PHEV Commercial offers the same unique 4WD solution as the passenger car. An electric motor on each axle means that even in EV mode, the Outlander PHEV remains a true 4WD at all times and a simple button allows the driver to select between normal, snow and lock modes to optimise the 4WD experience and staying mobile in all conditions. The Mitsubishi Outlander PHEV Commercial also features 18” alloy wheels, a heated windscreen, heated seats, heater and air-con scheduler function, reversing camera and electronic parking brake. The standard touchscreen audio system features Apple CarPlay & Android Auto compatibility along with Bluetooth connection and DAB radio.